The Main-Stream Media (MSM) or corporate media has recently began making moves to replace humans with robots or “automated journalism” to produce its news stories. Not to say that the corporate media journalists who currently work under the propaganda machine are independent and are committed to the truth. 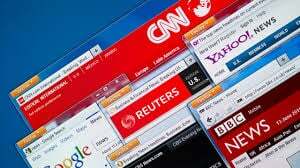 However, more than ever, corporate media conglomerates are slowly replacing those same traditional journalists with robots that can produce twice the amount of stories at a faster rate to beat out their competition is just one of the reasons for the change. But there is a bigger picture to this new advanced technology. “Why do we need you, if the basic idea is to get computers to do more of the work?” Micklethwait asked in the memo, obviously addressing an unspoken concern among his staff. One irony of automation is that it is only as good as humans make it. That applies to both the main types of automated journalism. In the first, the computer will generate the story or headline by itself. But it needs humans to tell it what to look for, where to look for it and to guarantee its independence and transparency to our readers. In the second sort, the computer spots a trend, delivers a portion of a story to you and in essence asks the question: Do you want to add or subtract something to this and then publish it? And it will only count as Bloomberg journalism if you sign off on it. Ken Doctor, an independent analyst who studies the news industry, told me this week that the rise of robot reporting is a product of the times — both technologically and in terms of the troubled economics of the news industry, which has led media organizations to search for ways to reduce their costs. “The robots are just another tool of new journalism,” he said. In the future, Doctor predicts, robots won’t just be reporters’ competitors. They’ll collaborate with us by preparing data-dense paragraphs that we can then supplement with our own analysis, producing a hybrid story that’s better than our human efforts alone. Charles Lewis left the CPI in 2005 which has been hijacked by the CIA-connected Ford Foundation, George Soros’s‘Open Society Foundation’ and other corporate foundations who are major contributors for the nonprofit organization. The corporate media will be a competitive market for journalists especially if they are competing against robots that do not require a salary, a retirement plan or healthcare benefits. It is not a hard choice for those who manage or own corporate media especially when it comes to their profits and political agendas.